Considering our age, we have decided to look into the possibility of stopping the full-time RV living and look at other options. So, with some misgivings, we are offering up our 2010 Mobile Suites and 2008 Ford F450 for sale. Let's begin with information on the fifth wheel. Also, there is additional information at the very end that is important to any potential buyer, so be sure and look at the "Disclaimer" at the end. Whole House Built In Surge Protect. Equipped with a 6.4L diesel engine, automatic transmission with Tow/Haul feature, and 4.88 rear differential ratio. The truck is a two-wheel drive vehicle and will include a 22,000 lb capacity Reese fifth wheel hitch (already installed). Current mileage on the truck is roughly 64,000 miles. The truck has been faithfully maintained with regards to oil changes and had new tires installed in June of 2018. (Roughly 1500 miles on the tires.) This is a two-owner vehicle with the first owner only having the truck for one year. We purchased the truck in the fall of 2009 and it had 46,000 miles on it at the time. The main thing with regards to a disclaimer is that we have priced the Mobile Suites at a low price due to axle issues. The trailer is equipped with two 8000 pound axles with Lippert Never-Lube bearings and axles. Two of those bearings (both on one axle) have begun to show leakage, and since parts are no longer available for the Lippert Never-Lube hubs, new axles will be needed. Additionally, the tires are in good shape, although they are getting along in age. I have not seen any evidence of cracking of the tires, but they will probably be needing to be replaced within about a year. 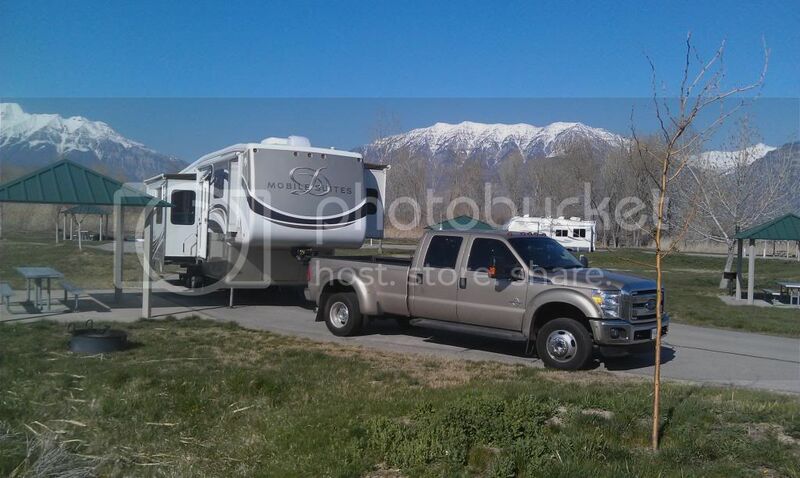 We have priced the Mobile Suites at $48,000 and the Ford F450 is priced at $35,000. The truck will not be sold separately unless the Mobile Suites has already been purchased. Additionally, there is the distinct possibility that the Honda EU3000iS portable generator will also be included in the sale (said generator is about 15 years old but still in good condition). I should also add that some things that we currently have in the RV may be included in the sale, such as some RV parts and other items of interest to the buyer(s) that we will no longer need. Other options for any buyer(s) would be that they may choose to accept or decline the furniture currently in the fifth wheel. Those include the Select Comfort mattress (some folks don't like them), the La-Z-Boy Reclinaway love seat recliner, and a jack-knife couch in the rear of the coach. Anything that the buyer(s) decline will be used to furnish an apartment for us. Wow, it was a surprise to see this listing. Wishing you both the best as you go through this change. BTW, for what it's worth, since we have the same year / model RV and have replaced our Lippert axles due to a bearing failure, the axles have to be manufactured and take a few weeks to be completed. As of 2015 the cost per axle was $1400. Best of luck Terry and Jo - glad we got a chance to see you last April as we passed through Kanab. Thanks, Dale and Ruth. We have considered replacing the axles ourselves, but there are so many options that we thought that a buyer might want their own choice. The various systems that I know of include MorRyde (which has more than one system), regular tapered bearings that one can disassemble and inspect and repack, Easy-Lube bearings, and Dexter has axles with their own Never Lube system of bearings. Since each has its own set of issues, we thought that a potential buyer might like to choose the option to have installed what they wanted. I was talking with a local RV repair service and even with the Easy-Lube bearings, they have to be lubed in a certain way. Basically, he mentioned that while lubing the bearings, the hub and wheel need to be turning to lube them correctly. Since grease isn't liquid, it would take a good bit of centrifugal force to spread out the lube as it should be done. We aren't really happy with the prospect of getting out of the full-time RV'ing, but nature can make us change our minds.